The Manhattan-bound F train out of Brooklyn has been sucking lately. There's more delays than ever with severe overcrowding during rush hour, and best of all, if the proposed MTA fare hikes go through, we B'klyners - and all other NYC subway riders - may soon have to pay 25% more for our unlimited Metrocards, raising the monthly bill from $81 to a sickening $103. But we F train commuters are trying to make the best of it. Those of us lucky enough to get seats (and those able to stand and balance a book without impaling other riders), often engage in a little literary escapism to make it through the daily drudgery. In addition to the staples of NYC transit: The New Yorker, The Bible, and the Twilight series (in that order), F train commuters indulge in a veritable cornucopia of literary pursuits, from the trashy to the classy. Named the "best site for music criticism on the web" by The New York Times Magazine, Pitchforkmedia.com has become the leading independent resource for music journalism, the place people turn to find out what's happening in new music. 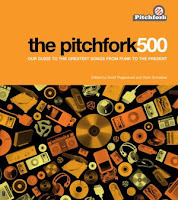 In The Pitchfork 500: Our Guide to the Greatest Songs from Punk to the Present, Pitchfork offers up their take on the 500 best songs of the past three decades. As a recent university graduate, I have worked as producer, editor, freelance writer, researcher, graphic artist, and web designer. And in my free time, I like to blog.